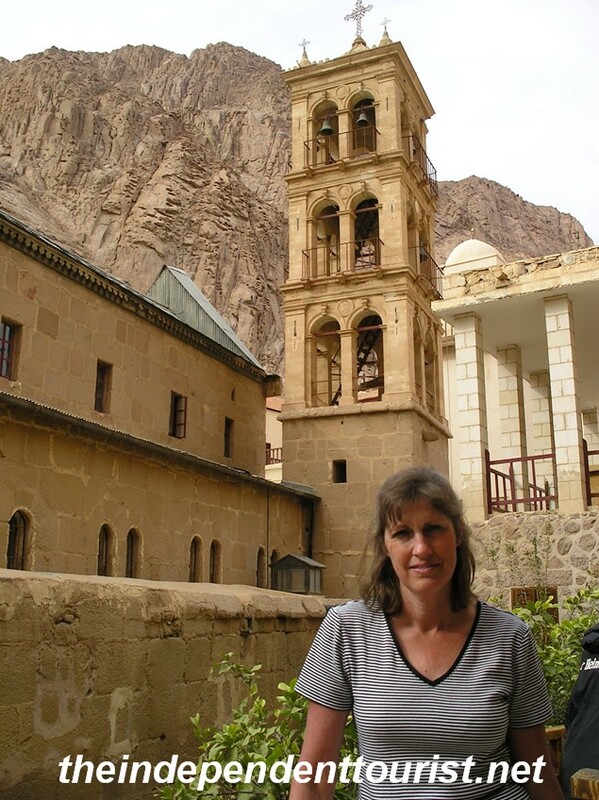 One of our most memorable experiences in Egypt was visiting St. Katherine’s Monastery and climbing to the summit of Mt. Sinai. It’s about a two and a half-hour drive through the unforgiving interior desert landscape from the resort of Na’ama Bay to St. Katherine’s Monastery, where the hike begins to Mt. Sinai. 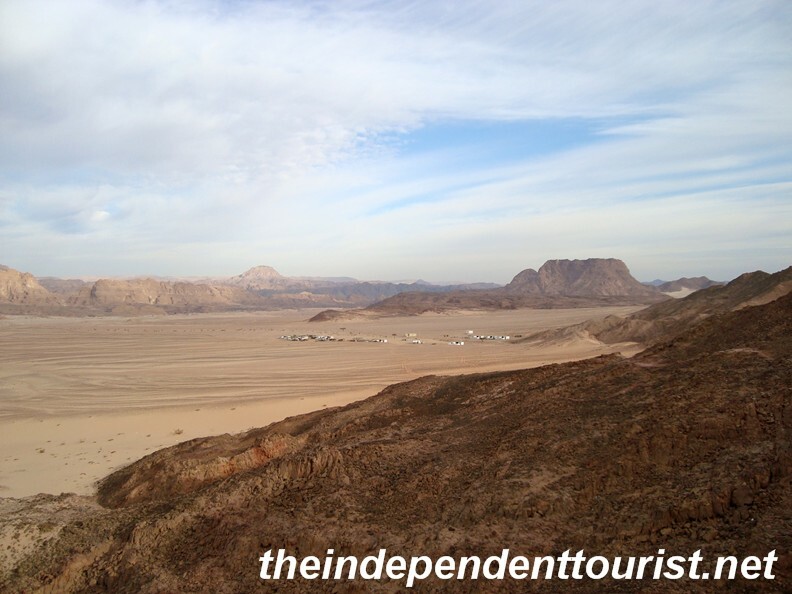 A view of the Sinai peninsula landscape on the way to Mt. Sinai. This area has been a pilgrimage site for centuries and is holy ground to three religions: Christians, Muslims, and Jews. According to the Old Testament, this is the place of numerous revelations by God (including the Ten Commandments) to the prophet Moses. The Israelites camped in this area for some time after miraculously escaping from the Egyptian armies by crossing the Red Sea on dry land. The Bell Tower at St. Katherine’s Monastery. It houses 9 bells donated by Tsar Alexander II from Russia. 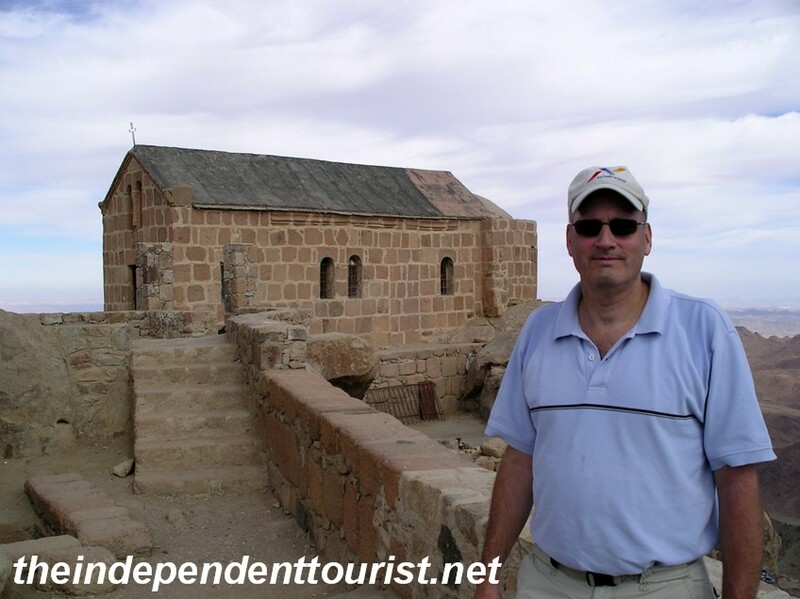 Considered one of the oldest continually functioning monastic communities in the world, much of the compact monastery is off limits to tourists, but it is still worth a visit and is the spot where all tourists begin their hike up Mt. Sinai. A view of the Monastery walls and some local camels. The 20 or so monks living here are Greek Orthodox and the first church was built here in about 337 AD, commemorating the spot where God spoke to Moses in the form of a burning bush. 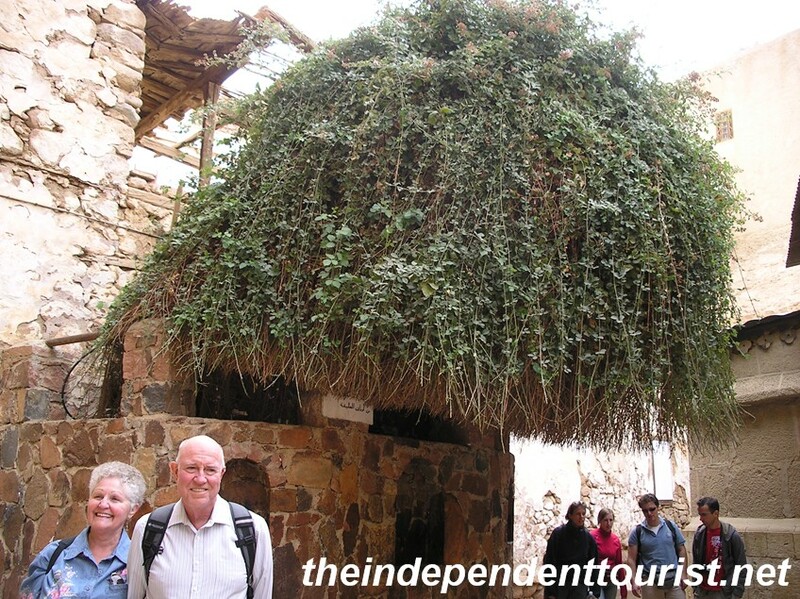 Interestingly, a descendant of an evergreen bush which grows nowhere else in the Sinai is found here. This evergreen is believed to be a descendant of the burning bush. Transplanted here in the 10th century from the nearby chapel of the same name. The Byzantine Emperor Justinian fortified the location and built the main Basilica of the Transfiguration in 527 AD on the grounds of the original church which became the origin of the monastery. There are two ways to climb the Mount (altitude: 2,285 meters or 7,500 ft). 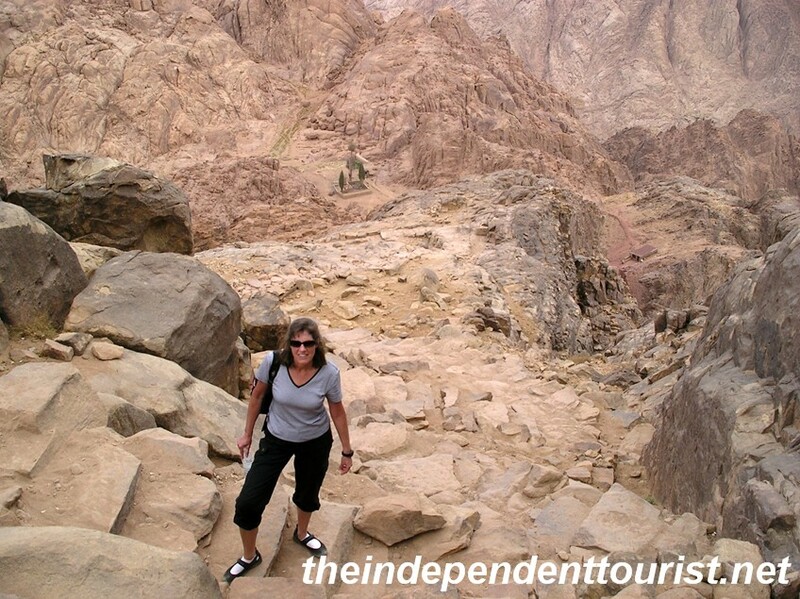 There is the “camel path” which is wider and more “gently” sloping, or taking what is called the “Steps of Repentance” route– a very steep climb of 3,750 steps (hard on the knees) which was built by a monk doing penance—what a price to pay! 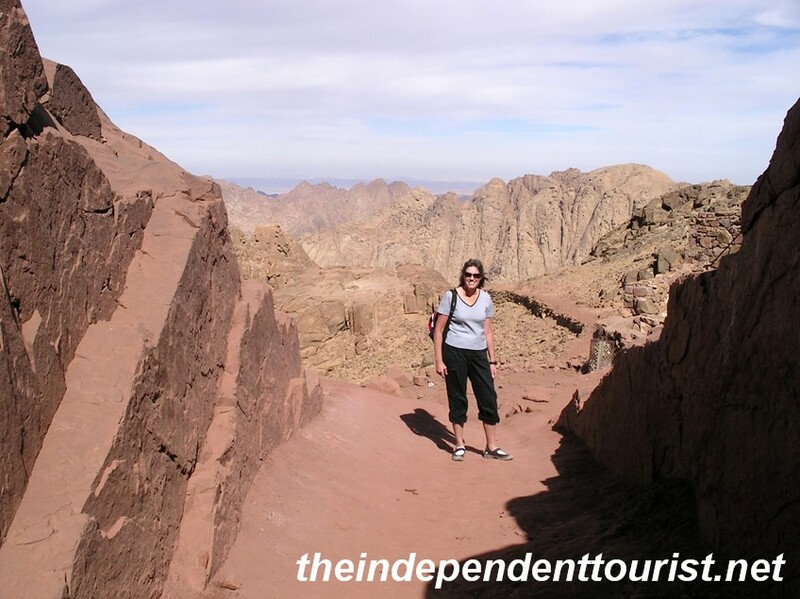 We took the camel path, and it joins the “Steps of Repentance” path 750 steps below the summit. 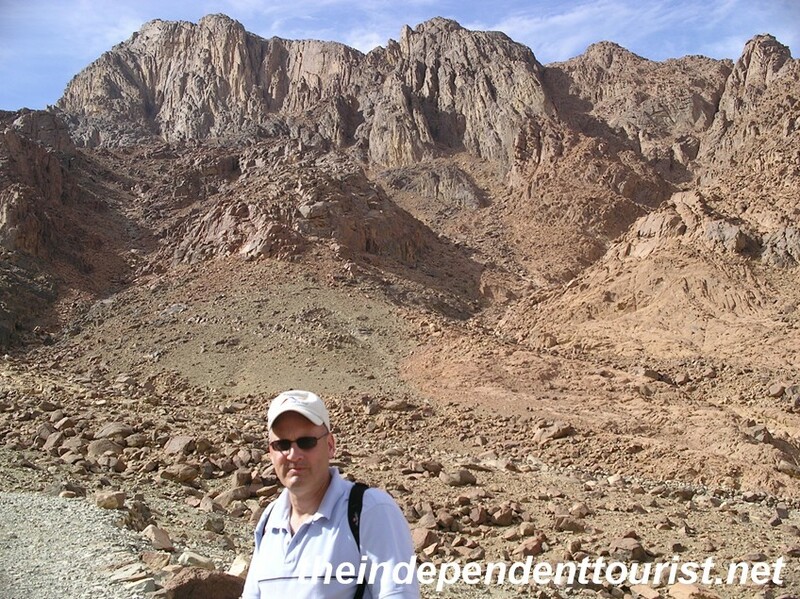 On the trail with Mount Sinai behind me – about halfway up. Going through a narrow gorge. Getting ready for the final ascent. Hiking up the last 750 steps to the summit. In the distance below is Elijah’s basin. The cypress tree is thought to be 1,000 years old. Those who traveled with Moses up the mountain waited here while he ascended to the summit to speak with God. You can take a camel up the path but we decided to hike it, and even at a good pace it took us about 2 hours to reach the summit from the Monastery. This is not an easy hike, and several members of our group ended up not making it to the top. The Chapel of the Holy Trinity at the summit of Mt. Sinai. A magnificent view from the top of Mt. Sinai. A lot of tourists leave at around 3 am to reach the summit for the sunrise. We were not that ambitious and arrived at the summit around noon. My wife and I had the top of this sacred mountain to ourselves at that time of day. The views are incredible and although the landscape is harsh (reminding me a bit of Death Valley), it was thrilling to be on the Mount which holds so much historical and religious significance to many people. 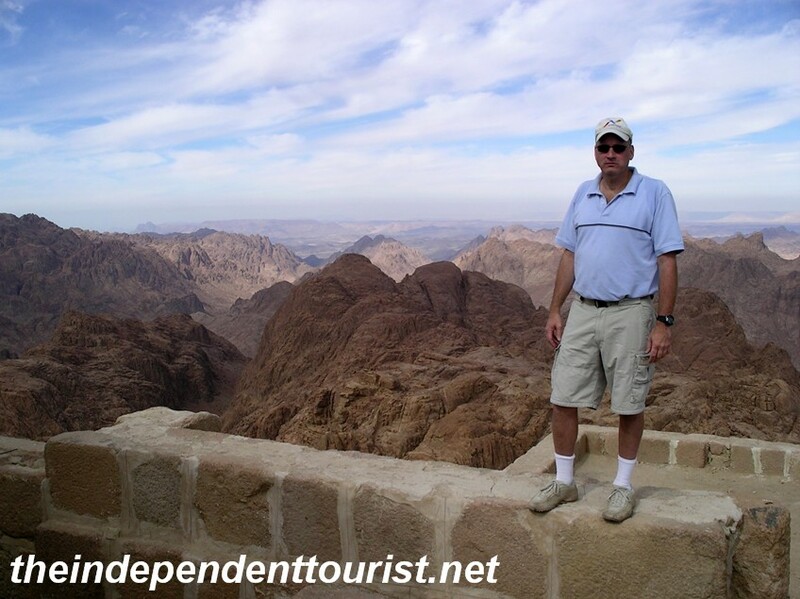 References: Lonely Planet Egypt, DK Eyewitness Travel Egypt. Love the pictures and enjoyed the description of the climb as well. Thanks for sharing!